Many readers will be familiar with Mad in America, founded by science journalist and author Robert Whitaker with the aim of providing a forum for rethinking traditional approaches to mental health care. We are delighted to be able to announce that we now have our very own sister organisation – Mad in the UK. 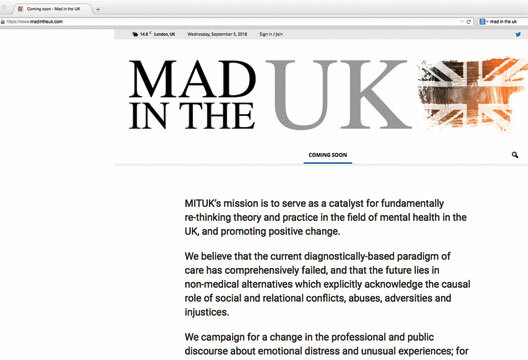 The Mad in the UK (or MITUK) website will carry UK-specific content and provide a voice for UK professionals, service users and survivors, peer activists, carers, researchers, teachers, trainers, lawyers, journalists, volunteers and others who are working for change in the field of what is usually referred to as ‘mental health’. We do have an editorial perspective – we believe that the current diagnostically based paradigm of care has comprehensively failed, and, along with many others, believe that the future lies in alternatives which explicitly acknowledge the causal role of social and relational conflicts, abuses, adversities and injustices. We campaign for a change in the professional and public discourse about emotional distress and unusual experiences; for support, both within and beyond services, which meets people’s real needs; and for social policy which addresses the causes of distress at its roots. MITUK will offer a hub for critical discussion, campaigning and action. In addition, MITUK will provide links to the many other resources, projects and organisations which are also developing positive ways forward. We are aware that the mere act of questioning current orthodoxies, or offering discussion of alternative paradigms in mental health, can be controversial. But we will promote respectful debate, free from discrimination, abuse or personal attack. We will also promote discussion and reflection through the creative arts including theatre, poetry, cartoons and artwork. We cannot and do not aim to be a competitor for The Psychologist, but we do feel that many psychologists (and other readers of this magazine) will enjoy reading and writing for MITUK. If anyone is interested in finding out more, please visit our site at www.madintheuk.com.